The defiant leader Moses rises up against the Egyptian Pharaoh Ramesses, setting 600,000 slaves on a monumental journey of escape from Egypt and its terrifying cycle of deadly plagues. THE REVIEW: Ridley Scott has directed many big epics before, the most notable probably being Gladiator which won the Academy Award for Best Picture in 2000. Exodus: Gods and Kings has many similar touches and is equally, if not more, grandiose than Gladiator. However, while the visuals and set pieces are impressive and a sight to behold, the storytelling leaves much to be desired. Whereas Gladiator told a story lead by Maximus (Russell Crowe) who you’d willingly give your life for on the battlefield, Exodus lacks a similar connection. Both Moses (Christian Bale) and Ramesses II (Joel Edgerton) fail to immerse you in the lands of Egypt or the lives of royals and slaves alike. Most times they lack an emotional connection and serve more as narrators or a background character rather than the heads of the good (Moses) and evil (Ramesses II) sides. In other words, there’s nothing about their characters that feel like it couldn’t be accomplished by someone else. Moses, the famous Biblical hero that parted the Red Sea and one that many people (even non-religious) have heard of, lacks that clout. Ramesses too doesn’t feel like he’s the King of anything and saying “I am the God, I am the God,” repeatedly doesn’t do anything to support the assertion since there’s little to back it up. Even moments that feel like they should add to a character’s credibility, like Moses speaking with God about what to do, don’t convey the significance they should. One last negative before I get on to the things I liked about the film (and there is plenty to like), is the pacing and structure of the film. Instead of moving from one chunk of the film to the next smoothly, Exodus feels very segmented and episodic in a way. The beginning shows Moses and Ramesses united, fighting against a tribal army, before it is revealed Moses is a Hebrew and is exiled. The next small portion shows Moses becoming a shepherd and starting a family before the next section where he finds God (represented by the child Malak, played by Isaac Andrews) and returns to Memphis to force Ramesses to free the slaves. The last chunk (spoilers, but not really as the story has been around for centuries), Moses leads his people (the freed slaves) to Canaan and delivers the Ten Commandments from Mount Sinai. All of theses chunks feel independent despite being closely related. The final chunk in particular with the Ten Commandments, feels tacked on just because it’s part of Moses’ story. It might have better served the film to just end once everyone crossed the Red Sea and leave out the very end. While the Commandments are no doubt one of the more memorable parts of the story, the way it was handled in the film makes it seem like an afterthought. While these problems can make the film difficult to watch in some places, overall, it delivers quite the bundle of entertainment. It is quite the site to see a couple hundred-thousand people march across the mountains, an army of chariots rush into a desert full of tents that seem scattered over miles, and a closeup of one of the monuments constructed in Egypt. Epic was the word I used earlier and it’s exactly the word to describe the visuals in this film. Like in Gladiator, a lot of these visuals in Exodus are created with computers rather than actual people or props as was the case in a film like Lawrence of Arabia, but the impact still remains. The things you see in Exodus gives you a sense of awe and wonderment as to the scope of everything. As a result, you tend to forgive some of the major problems just to see things unfold like a children’s picture book (although much more graphic and violent). 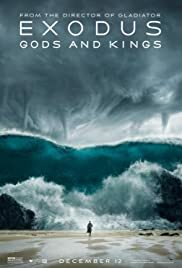 THE TAKEAWAY: Significant problems with the characters and pacing of the story are a detriment to an otherwise epic and entertaining Exodus: Gods and Kings. You won’t be swept away into Egypt in 1300 B.C. and you’ll be left with the feeling that you just watched about four individual stories packaged into one. But Exodus does provide a set of epic visuals that alone are enough to keep you engaged for the 2+ hour runtime.